Lately Jeff and I have been talking about how well or not well we parented our children. They are adults now. Jordan leaves in the fall for a university as a junior and Micah is headed to community college for her AA. She will still be at home, but Jordan will be gone. That fact truly saddens me and brings me joy at the same time. As a mom it’s my goal to raise my littles to fly. To leave the nest and be fine young people. However, it won’t be long before they are thriving adults (Lord willing) and I will have more time on my hands to think about and do other things. What will that be? When I’m old and gray, what legacy will I leave behind? When I think about the word legacy I think about Mother Teresa and Princess Diana. Those women left a great legacy of love, compassion and selflessness behind. Although the sons of the princess were always watched carefully when they were young. People wanted to see if they’d be like their mama. Now they are watch still, but more because of the throne. I wanna do something great. Like open a homeless shelter/ food kitchen in my small town. There are tons of homeless adults and children in this area and the nearest shelter is 30 miles away. We have a few empty buildings that would be great places to convert into small apartments on the top and a kitchen/community center below. I’d want it to be open 24 hrs with a full staff on hand. I’d want available showers and laundry along with donated clothing for job interviews and the changes in the weather. This place would be a home for anyone to come and rest, clean up, eat and seek Christian support for the various issues that would come along with them. It would also be expensive and a ton of work. So the idea just sits. But it’d be amazing to help those in the area. If it we’re ever come to pass it would be another part of my legacy. There are some amazing stories of legacy in the Bible. The story of Noah and the Ark. Abraham, Isaac and Jacob, Moses and Joshua, Joseph. Don’t forget King David and King Solomon. Then there’s Queen Esther and Rahab the prostitute. Mary the mother of Jesus and of course Jesus himself. I also think of Paul and James. What great men of God. How about Steven? The account of his stoning in the word is just brutal but encouraging as well. You can read the account of their faith in the Faith In Action chapter of Hebrews 11. My favorite of these stories is Joseph, but as I read through the Old Testament, I love how the stories of Abraham, Isaac and Jacob, Moses and Joshua just flow like a story. My favorite books of the Old Testament start in Joshua and goes to 2 Kings. then bulls will be offered on your alter. David was truly sorry for his sin. He committed great sin against God and Bathsheba. He lost his child and morned that loss. However, David knew he was wrong, he didn’t blame God, which is an easy thing to do. He picked himself up and moved on with the Lord. Knowing that God loved him and forgave him for his great sin. Amazing love. I love the part in verse 10-12. David knew God could right the wrong and make David a new man. That is HOPE. That is Davids legacy. I may never get to open a community kitchen, but I can pray for the Lord to care for the homeless in our area. I can ask how can I help them? What does he need from me? I want my legacy to that I left the world a better place. So what legacy will I leave behind? I choose to love and respect my husband. I have raised 2 fine young adults (so far). I try to be a good friend to those who call me friend. I am kind and live in peace with those around me. But most importantly, I serve a great and mighty God, the Lord Jesus. That is my real legacy. When I die I want to be remembered mostly for my relationships with Jesus and how I served Him. How I loved His people. Opening a community center/ food kitchen would be part of that service. If I never get to be a part of that, it’s okay. I will try to serve the Lord and ask him to use me how HE sees fit. What a great legacy! 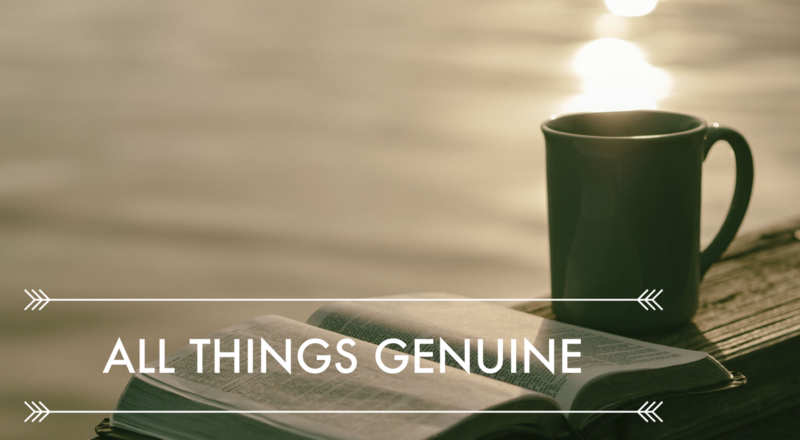 Thank you for stopping by All Things Genuine today. Great article Sabrina. It does make one stop and think. I too have had a desire to help the homeless, I do what I can personally but wish I could do more on a larger scale. I think my legacy is the example I set. How I treat my fellow man, raise my children, worship God and live my life. You are a joy and inspiration to me. Thank you for your willingness to serve others and share your words of wisdom and encouragement. Thank you! I hope someday, with or without my help there will be something like that here.